The U.S. Environmental Protection Agency (EPA) has found that indoor air quality may be two to 200 times worse than outdoor air quality. While statistics may sometimes overwhelm you with numbers, it is important to cite some figures when discussing outdoor air pollution, indoor air quality and the need for an effective air filtration strategy to combat airborne contaminants. Why is that something you should worry about? Because most of us spend 90 percent of our time inside an office, home or other types of workplace, and that means we are continuously exposed to pollutants than can affect our long-term health. That’s why air filtration is such a vital part of protecting your health, especially at commercial facilities where workers toil eight hours or more per day. This article provides some important takeaways from Camfil’s recent presentation at the 2017 Premier Breakthrough Conference in June, that can help you understand some of the challenges and solutions in improving air quality throughout the world. One of the key takeaways from the Premier Breakthrough Conference was the years of commitment that Camfil has made to the commercial air filtration industry. Camfil is one of the leading commercial air filter companies in the world. It was established in 1963 and has been manufacturing high-efficiency air filters and air purifying products that are designed to provide improved indoor air quality, save energy costs and provide years of service. Camfil is a global, privately held company that is 100 percent dedicated to the air filtration market. In 2017, the company anticipates $750 million in sales and is well positioned throughout the world with 26 manufacturing plants, six research and development centers, and more than 4,000 employees. Camfil operates under the principle that ‘Clean Air Is a Human Right,’ which refers to the fact that the World Health Organization (WHO) recently reported that, 98% of cities in low-and-middle income countries with more than 100,000 inhabitants do not meet WHO air quality guidelines. However, in high-income countries, that percentage decreases to 56%”, (2) still a significant if not surprising number. Clearly, developing countries are not playing on a level field, and in fact, some of these larger nations such as India and China are only now beginning to develop clean air solutions such as a shift to clean energy to reduce their level of toxic emissions. Comfort Air – the goal with ‘Comfort Air’ is to protect people by improving IAQ within the indoor facilities they most frequent, such as malls, shopping centers, retail shops, restaurants, and hospitals. Clean Process – the goal with ‘Clean Process’ is to improve industrial and medical processes where airborne contaminants can jeopardize the desired output, either a quality product or a healthy individual. Safety & Protection – the goal with ‘Safety & Protection’ is to protect the environment by eliminating harmful airborne pollutants and gases that may cause serious immediate damage to the environment or people. Another takeaway from the conference was Camfil’s goal of reducing the total cost of air filtration for commercial facilities. One of the main ways to lower the costs of air filters is to build filters that do not require frequent replacement. The average commercial air filter is made to last only several months before it has to be replaced. In the commercial air filtration industry, these are known as ‘sacrificial’ air filters, because their purpose is to provide short-term use at low-cost prices. The problem with sacrificial air filters, however, is that you will need to replace them three or four times a year, and in a commercial facility, the cost of multiple installations can start to add up. Camfil’s solution is to make filters with a lifespan of as many as two years, which drastically lowers costs by limiting installation expenses and lowering energy costs by providing filters that remain efficient for a far longer period of time. In fact, Camfil offers Life Cycle Cost (LCC) software that analyzes future costs of owning its air filters compared to owning standard air filters. The latest version is known as LLC Green, which allows you to compare air filters based on filter efficiency, filter life, filter change labor, filter cost, and disposal costs. Once all these factors are input, the software produces a life cycle cost for the selected filter, which gives you real-world expenses based on the type of filter you select. Camfil’s presentation also pointed out the direct correlation between air filters and energy savings at a commercial facility. As previously discussed, using standard air filters typically results in multiple changes, which increase the cost of filter ownership. But there is another aspect of cost savings related to the heating, ventilation and air conditioning (HVAC) system at a commercial facility. The fans, cooling, pumps, and steam for heating are all part of HVAC system, which means 65% of energy costs at the average commercial facility are directly related to HVAC. Camfil filters are able to maintain proper airflow and are made so that the HVAC system doesn’t have to work as hard to draw air through the ducts and vents. This means less energy is expended, resulting in monthly savings. Another important highlight of the presentation was Camfil’s ongoing commitment to using mobile laboratories to test the efficiency of theirs and even competitors’ air filters, and to test the ambient air quality specific to that location. The Camfil mobile labs are equipped with testing rigs that analyze filter performance under real-life environmental conditions. Furthermore, the mobile labs can also analyze air quality around a commercial facility such as a hospital, determine whether the facility’s existing filtration is sufficient to eliminate airborne contaminants and design an air filtration strategy based on the unique needs of that facility. Camfil also offers a mobile media tester, which analyzes the media used in your existing filters to determine if they are properly trapping the pollutants to improve IAQ. Air filters use media material such as synthetics, coarse media fibers, microfine media fibers, and polyesters. The Mobile Media Tester can analyze any media based on existing samples and let you know whether the filters in use at the facility are efficient. If there is one overriding principle that was evident at the presentation is that clean air matters for good health and for an improved quality of life. People throughout the world should have the right to breathe clean air, regardless of economic status. But too often, children and the elderly in disadvantaged countries are paying the price of outdoor air pollution at a disproportionate rate to other groups. 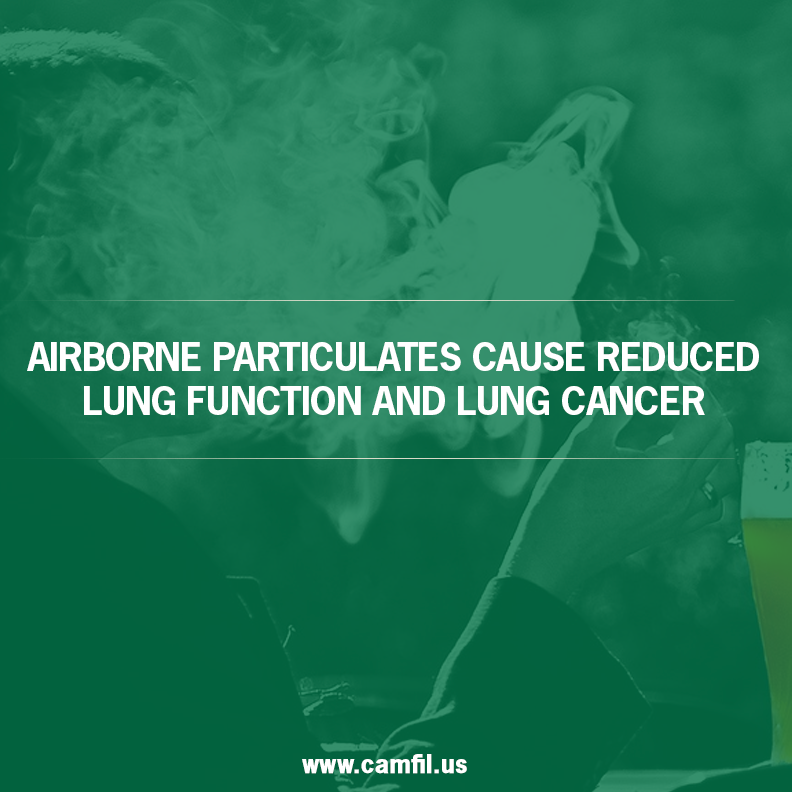 That’s because the undeveloped immune systems of children, and the weakened immune systems of the elderly makes both groups more vulnerable to contaminated air. While it’s true that clean air matters for good health, this is just the beginning of the story. Clean air also affects workplace productivity because of employee absences due to pollution-related ailments. Clean air also affects the rate of classroom attendance, because children with asthma and other respiratory conditions tend to miss more school when air pollution levels are higher. And finally, clean air matters because it is not a privilege, it is an inalienable right. For more than 50 years, Camfil has been waging a battle against outdoor pollution. Our commercial air filtration products are designed to help eliminate harmful particulates and to help keep you healthy. Please visit our website for more information about our products.